Veteran gospel musician Pastor Lawrence Haisa said he believes the late Chimurenga musician Chinx Chingaira will go to heaven. 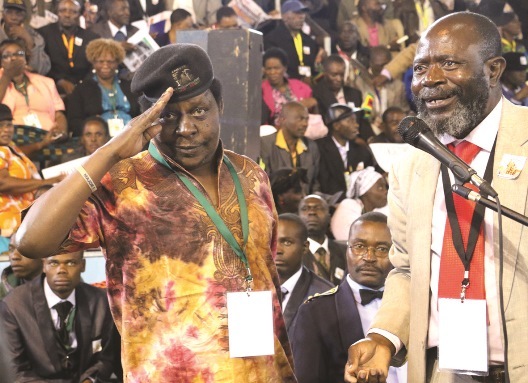 The ‘Burukai Mwari Baba’ hit maker who was among musicians who were paying their last respects to the Chimurenga icon said Cde Chinx was a Christian. “We all know it is God who really knows hearts of men and their destiny but as far as I knew Chinx, he was a good man. I wouldn’t be surprised if we meet with him in heaven. “Most people knw him because of his patriotic music but there is a spiritual side of him we also know. “I still remember when I once called him when he was still in hospital and he told me to come and see him but unfortunately I couldn’t make it. “In all the years I have known him, he would never go aginst things of God and I know he was a Christian. I was also informed that he was now attending a local church,” he said. Pastor Haisa added that he was a fan of Cde Chinx’s music. “I have known Chinx since the days of the liberation struggle because I also Participated as a mujibha.